"Whatever his stature in professional baseball, however many his notable contributions to its turbulent history, to his employees he was a cheap stingy tyrant." In addition to the inevitable constraints imposed by his lack of access to primary sources, as discussed in part four of this series, Eliot Asinof was also given a bum steer about how to approach his work thematically. In assembling 8MO, Asinof was greatly influenced by the work of two great Chicago-based writers who had been boys when the 1919 series was thrown. Nelson Algren and James T. Farrell were highly talented authors who had each penned short pieces about the Black Sox. Algren was ten during the 1919 series and his favorite ballplayer had been Swede Risberg, one of the banned Black Sox. His bittersweet prose-poem of remembrance, "The Swede Was a Hard Guy," was published in The Southern Review in 1942, and was quoted extensively by Asinof in 8MO. Algren, in return, later wrote an expanded version of "The Swede Was a Hard Guy" called "Ballet for Opening Day" in which he quoted Asinof and relied on Asinof's version of the scandal. Farrell was fifteen when the Sox took their dive, and his idol had been Bucky Weaver, another banned player whom Farrell would later interview. Asinof had started 8MO when he heard that Farrell already had a Black Sox novel in the pipeline. Asinof was going to drop his project, but when the two men met, it was Farrell who first offered to step aside. As Asinof described their meeting in his book "Bleeding Between the Lines," Farrell said "My book ... it doesn't seem to work. There's no reason for you not to go ahead, Eliot. In fact, you're the one to do it." He then proceeded to share everything he knew about the Black Sox, starting immediately and continuing throughout Asinof's researches, until 8MO was published in 1963 with a rave review from Farrell. James T. Farrell continued to write extensively about the game of baseball in general, and created several versions of his Black Sox novel, but never published it. After his death, scholars used three of his drafts to create a novel "Dreaming Baseball", which is the closest we will ever have to the Black Sox fiction Farrell had been planning. Eliot Asinof wrote the foreword to that novel about a fictional rookie who found himself on the White Sox bench in 1919. Asinof's admiration for and collaboration with these two literary giants brought great positives to 8MO, but at the same time, led him down a misleading thematic path which was buttressed by inaccurate information, and from which he could never escape. Both Farrell and Algren had been staunch leftists, and they tended to see the Black Sox scandal in terms of the injustice in the worker/management relationship, thus portraying the Sox as the exploited chattel of the miserly team owner, Charles Comiskey, whose slave wages and broken promises drove his players to turn against him. Asinof was himself a proud member of the old left who had once fronted for blacklisted authors, then had been blacklisted himself. The Algren/Farrell point of view was so consistent with his own weltanschauung that he incorporated it into his own thinking about the scandal, and allowed it to permeate every aspect of his narrative, even when it led him astray. In Asinof's view Comiskey was a parsimonious oligarch who ruled like a tyrant and became an arrogant plutocrat at the expense of his players. The Black Sox criminal trial is probably the source of that perception, because that had certainly not been the common view until it was generated by the defense strategy in that trial. There was really no way for the defense team to claim that the defendants had not taken money to throw the Series. Four of the players had confessed at one time or another, and the others were implicated by two eyewitnesses. But a defense had to be made, so the plan centered on three things: first: the technical legal strategy that their clients never actually did anything illegal even if all the accusations were true (throwing ball games was not a crime per se, nor was accepting money to do so); second, the obfuscation strategy of saying that the players and penny-ante gamblers were being prosecuted while the masterminds went free; third, the sympathy strategy of turning the tables, thus placing Comiskey on trial and positioning the ballplayers to the jury as desperate victims held under the thumb of a tightwad roughly on a par with Jacob Marley. 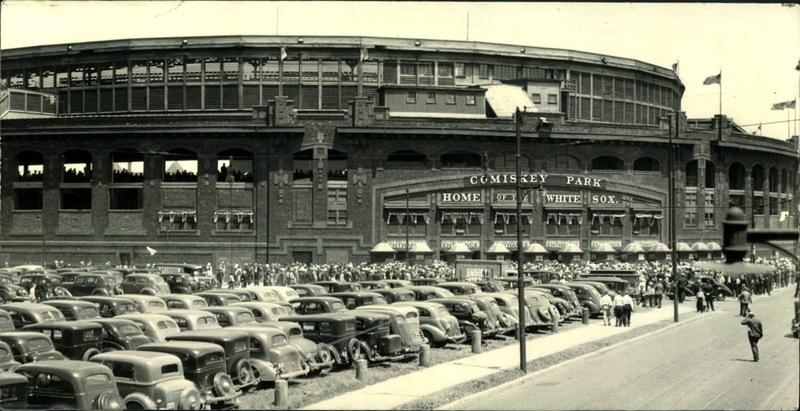 Most of the anti-Comiskey arguments crumble under scrutiny, but once such a perception is erected, it is difficult to dismantle. One of eight children in a working class family in Chicago, Charles Comiskey left school at 16 to become a plumber's apprentice, but set aside as much time as possible to play amateur and semi-professional baseball. 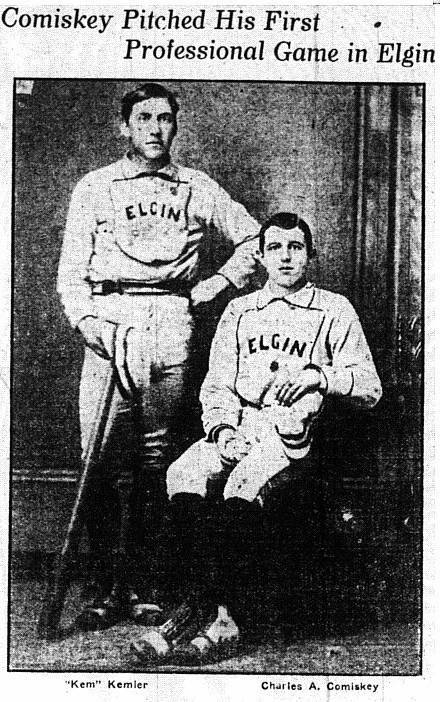 He began his professional career as a pitcher in the independent minors with a team in Elgin, Illinois (left, picturing Comiskey at age 18). After a very brief minor-league stint, and a conversion to first base, his talent landed him on the St. Louis Brown Stockings of the American Association, which was then considered a major league. Within a year, the leadership skill of the 23-year-old Comiskey led to his nomination as manager of the team, an almost unheard of honor in light of his youth and inexperience. He continued in the role of player/manager throughout his career, with that team and others. He set aside enough money during his playing career to purchase a minor league franchise in 1894, the Western League team in Sioux City, which he soon moved to St. Paul and renamed the Saints. The Western League prospered so well that they were able to challenge the established National League. In 1900 Comiskey moved his team to the south side of Chicago as the White Stockings of the renamed American League, and in 1901 the league declared itself "major," justifying that claim by acquiring some of the NL's best players, including Cy Young and Nap Lajoie. 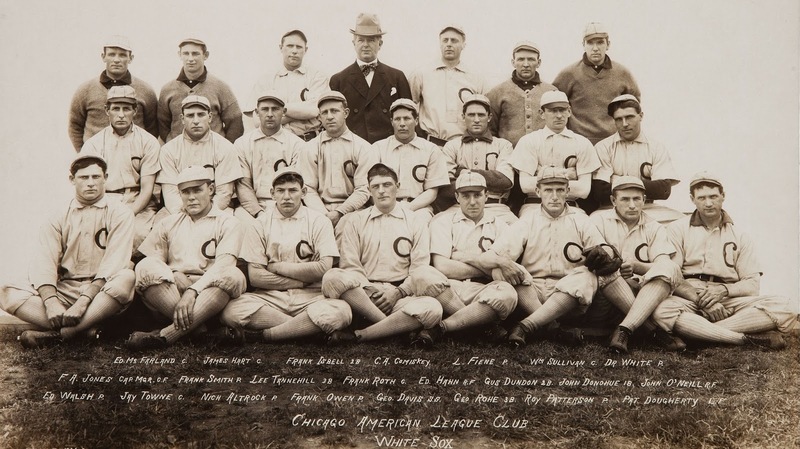 Comiskey is pictured below with the very first major league White Sox team. Next to him (to your right) is another future team owner, his manager and star pitcher, Clark Griffith. Back in 1886, as a player/manager, Comiskey had led the team to a World Series victory over the greatest team of that era, the mighty White Stockings. 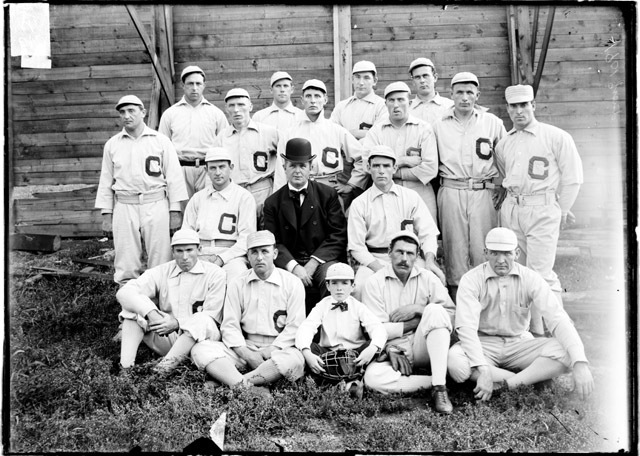 He managed a parallel feat as an owner when his 1906 squad (below) defeated the winningest team of the twentieth century, the formidable 1906 Chicago Cubs of Tinker-to-Evers-to-Chance fame. The Cubs had finished the regular season at 116-36. They fielded the best player in the National League at six of the eight non-pitching positions, and a Hall of Famer (Joe Tinker) at one of the other two spots. Their pitching staff had a team ERA of 1.76. They played .800 ball on the road. Many of their records still stand. They were considered all but invincible, yet they suffered the ignominy of a loss to Comiskey's Hitless Wonders, another team in the very same city. Most incredibly, the White Sox won all three games in the Cubs' home park. "Commy" was as good in the owner role as he had been on the field. He built one of the first great ballparks; he fielded strong teams; he held ticket prices below those of the comparable franchises with modern parks (a bleacher seat cost 25 cents at Comiskey Field in the WW1 era, compared to 50 cents at the Polo Grounds). 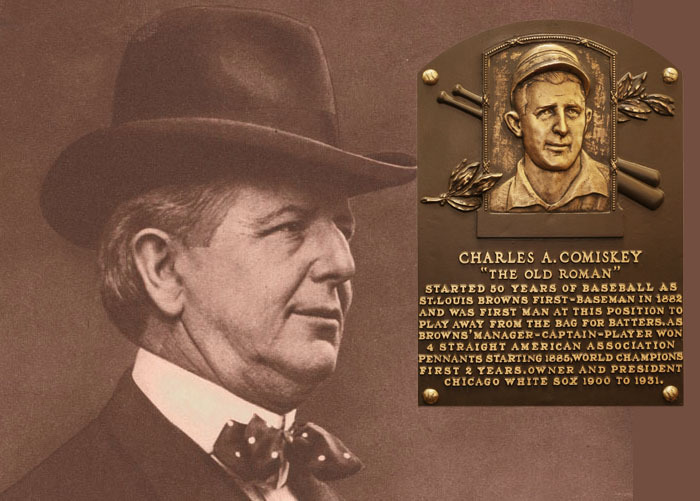 "A century ago, in his heyday as an owner, Comiskey was one of the most beloved men in baseball. He possessed an uncanny ability to connect to people and had turned his White Sox ballpark into a warm and welcoming venue that was the envy of his peers. Brimming with a genuine affection for his clientele, he always wore a smile and constantly mingled amidst the people before and after games." And the press loved him as much as the fans did. In short, Comiskey defied the Peter Principle. He had worked all the way up the baseball ladder without ever reaching a level of incompetence. He had once been just another blue-collar kid starting his rookie season with no special advantages, and eventually became a successful, beloved owner in his hometown, and he had done so without connections or family money, but on the strength of his own intelligence, preparation, thrift, ambition, and charm. Did Comiskey underpay his players? In a word, no, with one possible exception. 8MO is filled with factual inaccuracies about the salaries of the 1919 White Sox. It is possible to offer some defense of Asinof's poor reporting by acknowledging that the Major League Transaction Cards, which are now available in the Cooperstown library for every team since 1912, were not available to Asinof in the early 60s. It is impossible, however, to defend the fact that he presented wildly inaccurate guesses as if they were facts, and used those errant numbers to support his central thesis about Comiskey being a skinflint who drove his players to mutiny. Here's a blatant example: Asinof reported that Cincinnati's ace pitcher, Dutch Reuther, was making twice as much as the White Sox' Eddie Cicotte. In reality, Cicotte made more than three times as much as Reuther that year ($8,000 vs $2,340)! 8MO also claims that Comiskey's ballplayers "were the best and were paid as poorly as the worst." This is wildly inaccurate. Although the team had finished sixth in the league the previous year, the White Sox payroll on opening day in 1919, excluding performance bonuses, was about $88 thousand in 1919, third highest in the American League, and only slightly below the Red Sox ($93K) and Yankees ($91K). They had five of the sixteen highest salaries in the league in 1919, and seven of the top seventeen in 1920. The team's 1919 payroll was far higher than that of their World Series opponents, the Cincinnati Reds ($76K), whose cumulative payroll amounted to only $800 per win in 1919, compared to $1005 for the White Sox. Pitchers: Lefty Williams (#2 above), a banned player, may have been a bit undercompensated relative to his performance that year. His salary ranked only 23rd among the league's pitchers despite the fact that he won 23 games. His salary, however, was determined at the beginning of the year. It is reasonable to argue that his compensation was commensurate with the results from the previous year, when he won only six games. After his fine 1919 season, the team basically doubled his salary. Eddie Cicotte (#1 above), one of the ringleaders of the fix, had no cause to complain. His total compensation was the second highest among the league's pitchers, behind only Hall of Famer Walter Johnson. First base: Chick Gandil (#4 above), another of the ringleaders, earned only the fifth highest salary among the American Leaguers at his position, but the four men above him were clearly better players, as were two of the other men - George Burns (lifetime .307 over 16 years) and Harry Heilmann (spectacular lifetime .342 and in the Hall of Fame). Gandil was the worst regular first baseman in the league, although he outperformed Cleveland's entry because they didn't have a regular at that position. Even at that, the Cleveland player with the most time at that position, journeyman Doc Johnston, still had a higher OPS+ than Gandil. Gandil was the only first baseman in the league with an adjusted OPS+ below 100, and had the lowest WAR among the starters except for Johnston, who had only 331 at bats. Based on the 1919 statistics shown above, Gandil could not reasonably contend that he was underpaid, but then again he was a malcontent not widely known for his inclination to engage in reasonable dialogue. Second base: Future Hall of Famer Eddie Collins (Clean Sox) was paid more than the next two second basemen added together, and deserved it. Third base: Buck Weaver (banned player; #3 above) had the second highest salary among American League third sackers. The only man making more was superstar Home Run Baker, a future Hall of Famer. Shortstop: Swede Risberg (banned player; #5 above) had the sixth highest salary out of the eight starting shortstops. That was not out of line. He had the lowest range factor in that group by a wide margin, was also a weak hitter, had a below average fielding percentage, and was only 24 years old. Catcher: Future Hall of Famer Ray Schalk (Clean Sox) was the highest-paid catcher in the league, and deserved it. Left field: Joe Jackson (banned player; #6 above) had the second highest salary among the left fielders, which was exactly where he belonged, especially since he was coming off two bad seasons. You might be wondering who could possibly be worth more than Shoeless Joe? It was a young man named George Herman Ruth who, I've heard, was not a bad player in his own right. Right field: Nemo Leibold (Clean Sox) had an excellent season in 1919. He was a dependable player and a solid singles hitter with a .404 OBP, which was second on the team, behind only the redoubtable Shoeless Joe. Nemo ranked only sixth in the league in salary among right fielders. In fact, he was paid only $25 per year more than his understudy, Shano Collins, a part-timer who played in only 63 games. Leibold's low salary was based upon his previous career, which had been nowhere near the level he attained in 1919. In six prior seasons he had never previously achieved an OPS at the league average. In response to his fine 1919 season, the club doubled his salary the following year. Center field: Happy Felsch (#7 above) is probably the only one of the banned players who had a legitimate claim to be undercompensated. He received the fifth highest salary at his position, but was probably the third best player, behind only Hall of Famers Cobb and Speaker, and he had already posted two excellent seasons to support that claim. Relative to his own teammates, he was approximately as good a player as Schalk or Weaver but was getting paid about half as much. Felsch signed his 1919 contract in January of that year for $3,751.12 - for a whopping raise of $1.12 over his previous salary. Felsch was a simple, easy-going man with a 5th grade education and no skills in negotiation, so it may be reasonable to argue that the team took advantage of him. Eliot Asinof and his two socialist muses, Farrell and Algren, were correct in believing that all professional ballplayers in those days were exploited by management, thanks to the "reserve clause," which bound a player in perpetuity to any team he signed with, even after his contract had expired, unless the team decided to sell or trade him to another team. This arrangement was completely one-sided in favor of the club owners, and was obviously in restraint of a player's fundamental right to sell his services for what they were worth in a competitive market. The baseball reserve system was not many steps removed from slavery. When a team made a final salary offer, the player could take it or find another line of work for that year. He could not sell his services to another team in organized baseball, whether major league or minor. As a result, virtually all ballplayers before free agency were underpaid relative to their value in an open market. The 1919 White Sox were underpaid in that sense, but only in that sense. They were paid better than most of the other professional teams, so their salaries cannot be used to justify their unique level of corruption or to characterize team owner Charles Comiskey as a miserable tightwad. He was paying them at or near the top of the market, albeit a market both closed and rigged. As unfair as the system was, it is worth noting that the ballplayers made far more money than common laborers, which most of them would have been without their baseball skills. The average annual salary in the United States in 1919 was $1,331 for almost 2,400 hours of work, averaging 56 cents per hour. Even bench-warmer Fred McMullin (banned player #8 in the illustration) made $2,750 in 1919 for working seven months in the year. On a monthly basis, that is almost four times as much as he would have earned in a blue collar job. 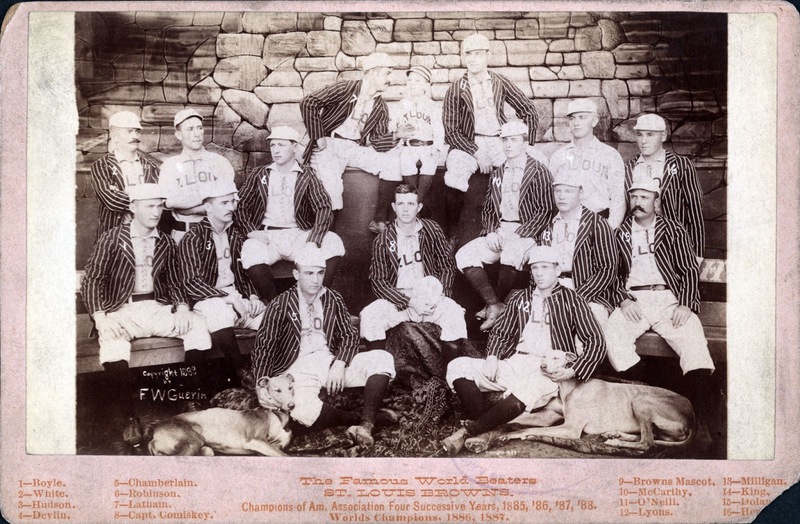 It is certainly true that the ballplayers of that day were not compensated like the ones in the era of free agency, but they still led better lives than they would have lived outside of baseball. If Asinof was wrong about the White Sox players being among the worst-compensated in baseball, was he at least correct about them being the best team? Well, they did win the pennant, and they seemed to be the best in the league in 1919. The golden haze of nostalgia has surrounded them with a special aura that seems to establish them as one of the greatest teams ever assembled, but they didn't impress people that way before the season began. The Syracuse Herald reported the 1919 pre-season odds in the April 18th edition, and the consensus of bookmakers was that the Red Sox would win the pennant. The White Sox were picked to finish fourth. Six days later, The Sporting News published the sportswriters' predictions, and their consensus ranked the teams in the same order as the bookmakers. The White Sox salaries at the beginning of the year were completely consistent with the general contemporaneous evaluation of the club. Did Comiskey cheat Eddie Cicotte out of a deserved bonus? "29 is not 30, Eddie." There is a tightly scripted sequence of movie scenes that drives the plot of "Eight Men Out" in a perfectly logical way. Gandil asks Cicotte to participate in the fix, but Cicotte declines. Cicotte goes into Comiskey's office to ask for the $10,000 bonus Comiskey promised him. Comiskey weasels out of it. The wheels seem to turn in Cicotte's angry brain. He wants that ten grand. Cicotte storms back to Gandil and says he'll throw the Series if he gets ten grand in advance. In a fictional film based on a novel. None of that, or anything similar, ever happened. In fact, it was about as far from the truth as anything could be. The public legend of the Cicotte bonus seems to have originated in a gambling newspaper called Collyer's Eye in the December 13, 1919 edition. The story was alleged to have originated from Cicotte himself, as told to a sportswriter named Harry Bradford. It was obvious at the time that the article could not have been accurate, and probably was written by someone with no grasp of baseball, because the author claimed that Cicotte became truculent after winning his 30th game and getting the brush-off on the bonus he was promised for achieving that milestone. The major flaw of that contention is that Cicotte never won his 30th game at all, as anyone who followed baseball would have known two months after the season ended. Asinof was never one to let some factual inconsistencies get in the way of a useful myth, so he cobbled the story to fit the facts. Surely Cicotte would have won 30 if Comiskey had not ordered him benched to avoid paying the bonus. In the book version of 8MO, Asinof claims that Comiskey's treachery happened in 1917. That turned out to be not only a false claim, but a ludicrous one, given that Cicotte had never won more than 18 games in any previous season, so an incentive clause for winning 30 would have seemed laughable, about like promising Gus Triandos a bonus for stealing 50 bases. The part about Comiskey ordering Cicotte to be benched made the story even more surreal, since it was just about the opposite of what really happened. On August 22nd of that year, the White Sox clung to a narrow two-game lead over the Red Sox, whereupon they turned to Cicotte, their ace, to take the mound every time he could pitch without pain. He had only 18 wins at that point, but pitched in 11 of the team's final 33 games and got the decision in every one of those games, winning ten of them to finish the season with 28 victories. There were some periods when he got no rest at all. He pitched a complete game victory on September 2nd, then came right back the next day and pitched six more innings for another win. Five other times he took the mound after only one or two days of rest. Altogether he pitched 84 innings in little more than a month. It is just about inconceivable that he could have pitched any more, and he most certainly was never benched, with or without Comiskey's orders. "After winning 28 in 1917, Cicotte was given a contract with a base salary of $5,000, a $2,000 signing bonus and an additional agreement that he would receive a $3,000 bonus if he had another season similar to 1917. In 1919 ... the $3,000 bonus was carried over so by the start of the eastern road trip he had 28 wins, thus assuring that he would get the bonus." He finished the 1919 season with a 29-7 record and an ERA again below two, whereupon the White Sox paid his bonus, presumably with a grateful smile. As for the Comiskey-ordered benching, yet again it was the opposite of what really happened. Cicotte won his 28th game on September 5th, assuring that he would make his bonus, then took sick and missed about two weeks. Since Cicotte had earned his bonus and the team had a comfortable lead at the time, it was not considered a significant matter. He returned on September 19th to win his 29th game, and the pennant was all but assured, so it was Cicotte himself who then asked for some time off to spend with his family, obviously indicating that the 30th win did not seem critical to him. That request was granted. He also got two more starts after he returned, so it's clear that nobody on the club was trying to keep him from reaching 30. "29 is more than 28, Eddie, so here's your check. Nice job!" 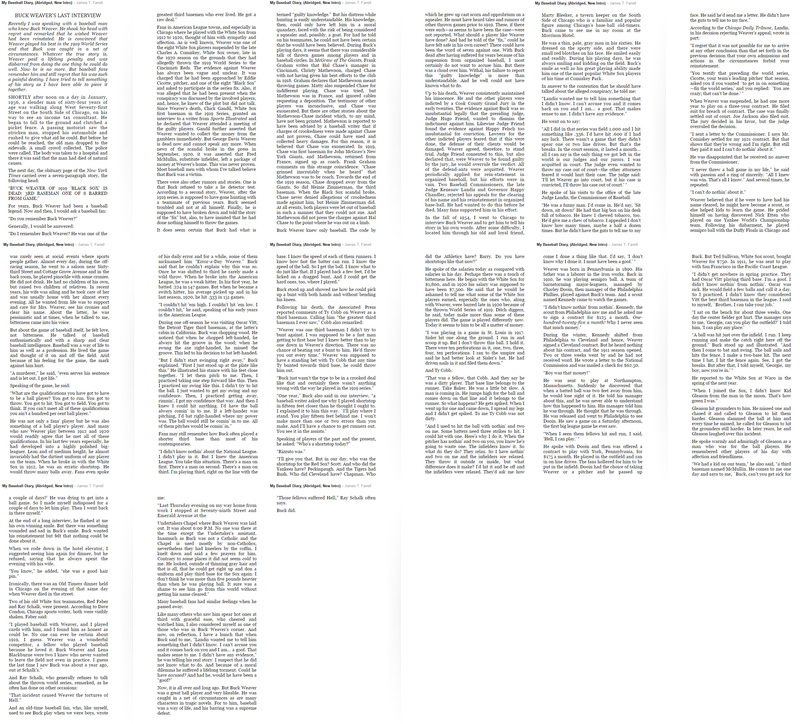 That shows you why I will never be asked to write a movie. Did Comiskey pay his players a lower per diem meal allowance than other owners? Yes, he did for a while. To contend so is not an outright error, but is highly misleading. The standard per diem meal allowance had been three dollars per day in 1918, and this rate was applied just about universally throughout the majors. When World War One ended, the fans were expected to return, and some teams raised the rate to four dollars in anticipation of post-war prosperity. They did so on their own, not in concert or as the result of an agreement. 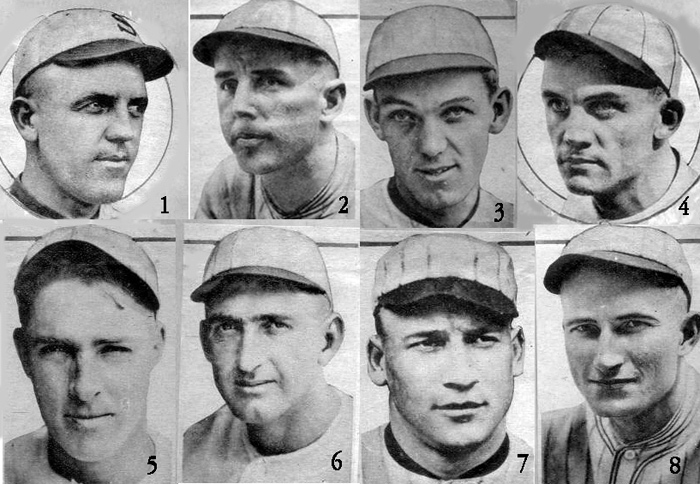 The White Sox began the 1919 season at the old rate. On May 18th they acquired journeyman pitcher Grover Lowdermilk from St. Louis to shore up an ailing pitching staff, and he reported that the lowly Browns had raised the per diem to four dollars. This precipitated a controversy in the invariably contentious White Sox clubhouse, which led to a change. By the end of the season, the White Sox meal allowance had been raised to four dollars per day to match the new de facto standard. Was Comiskey getting ever richer off his starving players? Contrary to the defense team's contentions in the Black Sox trial, many of which linger in today's conventional wisdom, Comiskey was not accumulating vast wealth by riding the backs of his players. Court records from 1915 to 1917 show that the White Sox made an average annual profit of $141,000 and Comiskey himself earned a salary of $10,000 per year, substantially less than his second baseman, Eddie Collins ($15,000). The team's annual profit was modest in comparison to the New York Giants, who cleared $250,000 per year from 1912-1917, despite lower attendance than the White Sox during that decade, according to the biography "John McGraw" by Charles Alexander. Of course Comiskey was frugal. That's how he managed to save enough to buy a team on a ballplayer's salary. Given that aspect of his nature, he took some actions which made him seem penurious to his players. Some of their criticisms of him were misinterpretations, deliberate or otherwise, but Comiskey made mistakes as well, for he was human. It is true that later in his life, especially after the Black Sox scandal, his personality did start to evince some of the negative characteristics that color our current attitudes toward him. But to take all of that out of context in order to limn the Old Roman as a cantankerous, avaricious miser whose penny-pinching ways drove his players to dishonesty in 1919 is to do a great disservice to a man who, while not without flaws, on balance was a good man as well as a great one.